Couple years ago I got back to photography and buying my first digital camera (way late to the party, yes). I also wanted new backapck with decent photo compartment, but not too specialized for it. Since I was already quite a fan of Crumpler by then (ah, that balance of robust materials with slightly crazy descriptions) the model literally called “Half Photo” (not the System one) seemed like a fit and I had been using it since. The backpack quite literally consists of two parts, of which one is photo and other… not–photo I guess. Photo compartment occupies the bottom of the backpack. It has its own zipper for access and is padded on the bottom and all sides. Layout is meant to hold camera in the center and up to four lenses at the edges. All internal dividers are movable and removable. Since my camera is pretty compact mirrorless model I often end up putting it inside in its own case. Also often use remaining space for cables or things, rather than set of lenses. Since the bottom is slightly curved on front, the backpack doesn’t stand too well on its own. Also it probably takes someone with way better coordination to get camera out on the go, I need to stop, take it off and put it down to deal with that. Not–photo compartment occupies remaining space. 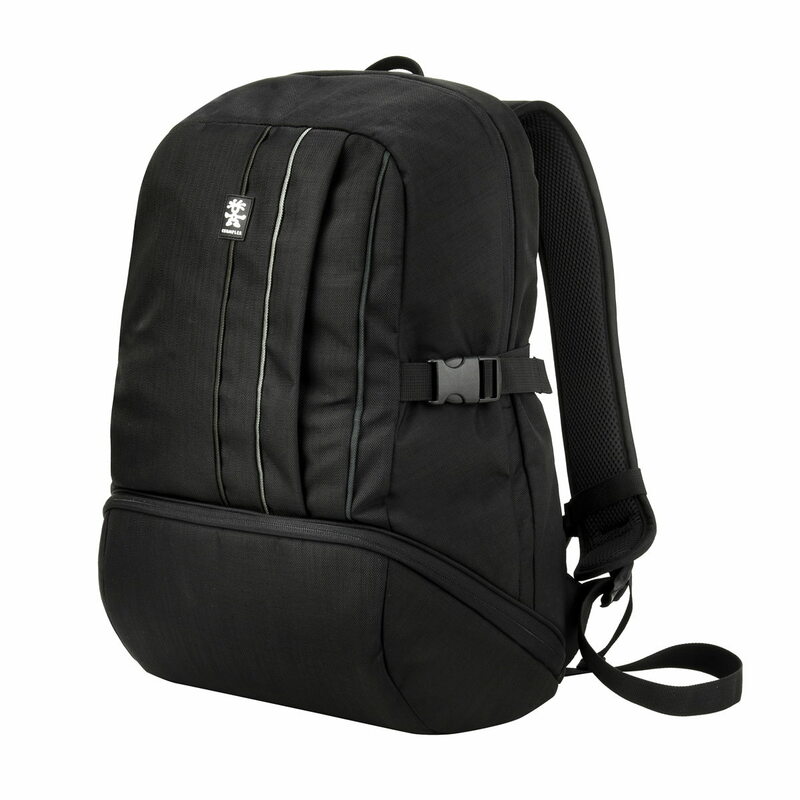 It is accessed through more conventional zipper from the top of backpack. Its bottom it actually a trap door with a zipper — it can be opened to combine both compartments into single large one. Due to construction bottom commonly doesn’t stay perfectly horizontal and slants towards the front. It’s not much of a problem, but can be tad annoying when it causes things to shift too. The notebook compartment goes all along the back, through both top and bottom parts in height. It is very sizeable, my 13″ ultrabook gets lost in it, even with neoprene sleeve. Divider between notebook and main compartments has all of available internal pockets on it. My biggest gripe that none of them are zippered, unless things can hold on to pocket (like pens do), they fly out and all over backpack pretty much immediately. There is single semi–hidden external pocket on front. It is closed with vertical (what?) zipper, which at least does keep things inside, but makes it quite inconvenient to access. The back is padded and has comfortable mesh surface. It’s pretty flat with no anatomical curving or anything, the fit depends on personal taste and dimensions, I find it very comfortable for myself. The straps are padded. They have chest strap and plenty of loops for possible additional attachments on them. The hip belt is wide and nicely padded, but since backpack is relatively short vertically the belt ends up sitting pretty high (so more like waist belt). The one issue with it is that it has nowhere to go other than around you. So while it’s super comfortable when backpack is completely wrapped around you with all straps buckled up, it totally gets in the way for quick on–one–shoulder mode. There are two compression straps on the sides. They work good enough, but since bottom compartment is fixed the backpack looks tad deformed with low load. Site seem to have attempted to claim compression straps double as tripod straps, but that totally doesn’t work with only one on the side. I carry my tripod inside main compartment and actually prefer it, but the larger one won’t have a good place to go. Other than city use the backpack had served me as airplane carry–on for several trips to conferences (no checked in baggage). The compact half–egg look is deceptive, I could easily pack for 2–3 days + 2 travel days trips with space to spare. Combining compartments works better (or space got wasted). The downsides are not too convenient access through top zipper and rounded form makes it harder to make full use of space. For a week–long trip I hadn’t risked using it. While, starting with the name, backpack screams “compromise” — it is very well executed compromise. It excels both at its intended and more general uses, without any critical deal–breakers. Materials (as always with Crumpler) are super robust and show little to none wear after two years of use. And just as I had finally got to writing it up, the Jackpack version had been retired by Crumpler in favor of new Proper Roady Half Photo backpack. Other than those tweaks it seems like mostly same backpack.